I’m a total sucker for ladies with fiery red hair, so when deciding which Witcher character to cosplay, Triss was a no-brainer. Triss was the first complex character I’ve done that was almost completely a sewing project. The only things that weren’t sewing on this costume were some minor painting and fabricating a medallion (which I actually had already done prior to even starting the costume). Sewing, at one point, was my most feared of all art forms. I only started to really learn to sew after I got into cosplay, whereas I’ve been sculpting and painting all my life. Slowly but surely I’ve been learning more and more about sewing as I chug along on various costumes, and by the time I got to Triss, I was actually pretty confident in quite a few different techniques. It made tackling the project much less stressful. To start out with, I needed to make patterns. Triss’s clothing is pretty unique in terms of every day wear, so pre-existing patterns that would work for her didn’t really exist. I couldn’t even find something I thought I could alter easily, so I went ahead and made my own. To start with, I made the pattern for her leather vest. Wearing tight fitting clothing, I wrapped myself up in foil and masking tape. Once I was sufficiently covered, I started to draw out the lines for the vest pattern. Since the vest would be symmetrical (as most garments are) I only needed to draw out one side. With the pattern lines drawn, I simply cut myself out of the foil and cut out the individual pieces for the vest. With my foil pattern, I cut some pieces out of scrap fabric I had laying around and tested the fit. Wherever I found a spot that needed taking in, I marked it with some pins and re-sewed the garment so it would fit properly. Once it was perfect, I took it all apart so I could use those fabric pieces to make a new pattern. I transferred the fabric pattern onto paper, added a 5/8 inch seam allowance to all the pieces, and marked where the buttons and loops would go on the sides. Once that was done I had a nice, clean pattern for the vest made exactly to my measurements! A lot of people whom I saw made Triss’s outfit used real leather to make the vest, but I went the cheaper route and used a faux leather material I found in the halloween section at Joanne’s (it is the only fabric store in my area *sigh*) Since it was after Halloween it was crazy cheap and I bought two yards because it seemed like it would be useful for various things in the future. Despite it being fake, I still felt like the material looked and felt pretty good. So I cut my pattern pieces out of it, used a light colored pastel pencil to mark the button/loop placements, and began sewing! I used a slightly longer straight stitch for the top stitching and made sure to use white thread for everything. I made the loops by folding a thin piece of the fabric in on itself and stitching it down along one side. I then cut some small pieces from it and sewed them onto their respective places along the sides of the vest. Lastly, I hand sewed the buttons on and I happily stuck the thing onto my dress form for safe keeping. For the shrug, I used the same basic method for creating the pattern, but instead of using my body to make it, I used my dress form. To pattern the collar, I eyeballed the basic shape and used trial and error to get it the right size and to fit properly. The sleeves were a bit easier. I had a pattern for sleeves from a previous project that I altered slightly to resemble Triss’s sleeves. The shrug, obviously, was a bit more complicated than the vest. It was made of quite a few small pieces that fit together like a puzzle. You can see all the pieces below. It is also made up of three layers; the outside, interfacing, and a lining. I used a lightweight interfacing for the body of the shrug, and a heavyweight interfacing for the collar. The collar needed the extra stabilization in order to lay correctly. Before sewing all the layers together, I pinned it in place and checked it on the dress form and on myself to ensure the fit would be right. Once I was convinced, I sewed it together for real. Since all the edges would be covered in trim, I simply sewed it all together right sides out, rather than right sides in, and used bias tape to encase the edges. I then used a combination of a long straight stitch and a large zig zag stitch to get the decorative top stitching along the trim. The sleeves obviously had a lot more work go into them than the shrug. It took me a bit to decide how I wanted to make the checkerboard pattern. After one failed attempt, I decided on a method. I measured out the checkerboard pattern and drew it on with a pastel pencil. Then I stuck a thin layer of batting between the blue fabric and a thin backing fabric and quilted the lines with my sewing machine. Next I twisted two colors of yarn together (a light blue and ivory) and stitched them over the quilting at every point they crossed by machine. With that, the checkerboard pattern was on, but not yet complete! At this point however, I switched what I was doing and sewed the sleeves together. I sewed the blue fabric and lining together inside out and turned the piece right side out. I added a cuff to the ends and covered the top with a bias tape trim just like the shrug. Once this was done, I completed the checkerboard details by hand sewing pearl beads to each intersection and also hand stitching the yard down along the quilting lines. The machine sewing I did to attach the yarn at the intersections wasn’t enough to keep the yarn down along the lines, but I also didn’t want to machine stitch it along the lines because I wanted to make sure the stitching would be invisible, hence why I waiting until the end to hand stitch it down. After all this, I moved onto the belts! I didn’t make them from scratch, but instead started with existing belts and altered them to look more accurate. I was lucky enough to find a belt thin that was already a similar color to what I wanted. The only issue is that it was too light. In order to darken it, I used in ink that I happened to have lying around; Jacquard Piñata Alcohol Ink in Baha Blue. These inks are amazing! They are, as the name implies, alcohol based so they are permanent and are not affected by water once dry. They also work on practically any surface and give a beautiful highly saturated but also transparent color. All I did was take a brush, apply a thin layer to my belt, let it dry, and I was done! I even tried to smudge the color to see if it would come off and it wouldn’t budge! I was also happy to find the the color did not crack at all when the belt was bent. It could not have been more perfect! To finish off the blue belt, I used bead caps to mimic the star shapes on Triss’s belt and made a “metal” cap for the end of the belt with Apoxie Sculpt. To make the cap for the end, I wrapped the end of the belt with plastic wrap and sculpted the cap directly over the belt. I worked carefully and did one side at a time, letting the first side dry completely before moving on to the second. Once it was all sculpted and dry, I slid it off, sanded it smooth, and gave it a coat of black acrylic paint before coloring it with Rub N’ Buff silver leaf. I love to use Rub N’ Buff on many of my projects because it gives a convincing metallic look without chipping or scratching off like paint can. It also is not affected as negatively by spray finishes like most metallic paints are, so I can seal it without loosing the shine. To seal it, I used Crystal Clear Enamel in gloss by Rustoleum. Last, I glue everything on with E6000 and let it sit for a day before touching it again, just to make sure it was completely dry. I was a bit scared that my bead caps would end up popping off when the belt was bent, but so far I haven’t had any problems! The larger belt was much easier. I only had to darken it with some leather dye. I will say in advance that I do not know much about leather working, but the methods I use work well enough for me. If you’d like to learn more about leather working I would suggest researching the topic extensively on your own. My methods may not be optimal or even right. Next up was the pocket that sits on the brown belt. I didn’t want to make it with real leather, and I didn’t have any fabric that was the right color, so I tinted the faux leather I used for the vest to be slightly red! What did I use to do this? Jacquard Piñata Ink again! This time I used Sante Fe Red, and I brushed it on using curricular motions to give it a random, stippled look rather than just a flat wash of color. I used a very large brush and was pretty rough with it. Piñata inks dry very fast as well so I had to work fast. I made the pattern by studying the digital artwork and various screenshots of Triss and drafting it from scratch. (I ended up not following my pattern 100% though and I really regret it. I personally think the pocket I made turned out too large and I would like to remake it eventually). Once I had my fabric pieces cut, I used painters tape to mark off where the white stripes needed to go, and then I painted the white stripes on with Liquitex Basics acrylic paint watered down to a watercolor consistency. I then sealed the stripes with Rustoleum’s Crystal Clear Enamel. I swear the stuff works on everything! Once the pocket was sewed together, I stuffed it with some coardboard to help it keep its shape and strung it onto the belt! Next it was time for the boots! I bought a pair of brown mid calf length boots with belts around the ankle and cut the shaft down each side so I could fold them over for the cuff. I also hand stitched the edges together on the inside so that they wouldn’t come apart on me while I was working. Then I used a red upholstery vinyl to make the lining and used the faux leather from the vest as the trim. I sewed the trim to the red vinyl by machine with a white top stich and then sand stitched the lining to the boot cuff. I also used the red vinyl to make the belts red. I simply used masking tape to make an exact pattern of each belt piece and used that to cut the red pieces to fit directly over the top of them. I also machine stitched the white top stitching onto the the red strips, and then hand stitched the strips to the belts along the top stitching. Once all that was done, I tacked the newly made cuff down to the boot so that it would lie flat with a bit more hand stitching. I had to use a very large needle in order to get through the thick boot material. Next I moved onto the gloves. Oh how happy I was to make a pair of gloves that DIDN’T require fingers! To make the pattern for them, I used the foil and masking tape method again, but only used a 1/4 inch seam allowance this time. The reason being that with the shape of the pattern and the fact that I needed a slit cut down the side of one piece, it just simply didn’t allow for a larger seam allowance. 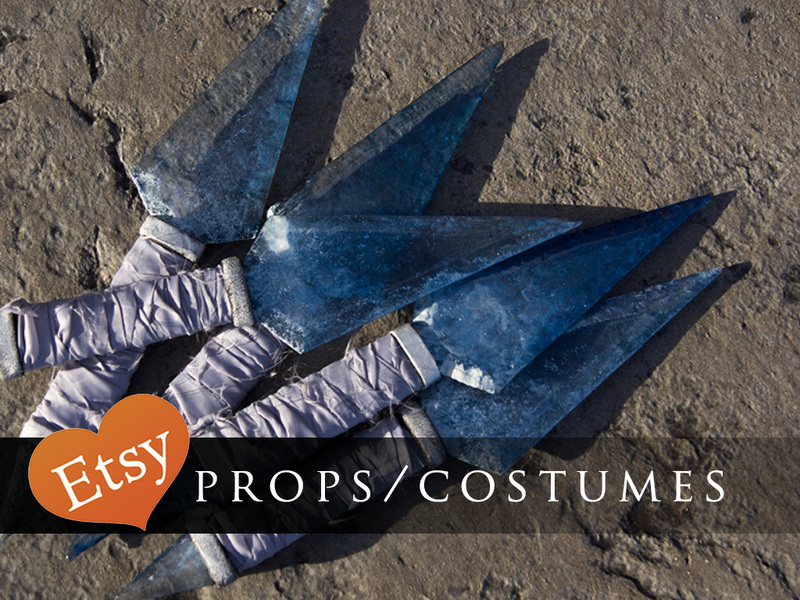 The gloves were rather easy compared to the rest of the costume, and I really enjoyed making them. I found the perfect red suede fabric to use for them and some gorgeous silver buttons with large pearls (fake of course). I sewed them together normally and used a long straight stitch for the top stitching. I also made the loops for the buttons with the same method as I used on the vest. Last, I constructed the leg warmers. To make the pattern, I actually took measurements of my leg instead of using the foil/tape method. I took multiple measurements around my leg, drew the pattern out, cut the fabric with a 5/8 inch seam allowance, and then tested it and altered it until it fit properly. The fabric I was using was a 2 way stretch so I was able to make it comfortably form fitting. To make the poofy tops, I patterned out the piece to fit VERY loose around my leg. I also sewed the pattern pieces together so that it would have holes evenly spaced along the entire thing. I stitched each piece together leaving an open space in the centers, then I pressed the seam open and stitched all the way down the sides, which gave a nice finished edge and a nice hole in the center. I also sewed the ends together so that it made a circle. Then, I cut a rectangle of white fabric to fit in right behind the black section and basted them together. Next, I cut a piece of batting to fit inside the rectangles I just made, folded it over so it was a double layer, and then encased the batting to the inside of the white and black rectangle, which gave me a nice doughnut shape that I then attached onto the top of my leg warmer. For the very last step, I made a thin strip of cream fabric to tie around my calves. The medallion was actually the easiest, and the most fun, part of the costume for me. To make the medallion, I started by sculpting one out of Super Sculpey Firm. I then used that to make a silicone mold, and then I cast the medallion with resin that I had tinted gray. Before it was fully cured, I popped it out of the mold and formed it over a curved surface to give it the subtle curve that Triss’s medallion has. I then painted the inside section of the medallion with a metallic teal paint that I mixed with acrylics and Pearl Ex pigments. I also used Rub N’ Buff in silver leaf to give it a silver finish where needed and a metallic gold ink for the gold areas. Last, I sealed the piece with the Crystal Clear Gloss again and put it on a copper toned chain. You can buy Triss’s necklace (as well as Yennefer’s and Geralt’s) in my Etsy shop! Those in my shop, however, do not come curved as mine is. Lastly, I put the fancy design on the vest. I saved this part for last because I was honestly not sure how to do it. The method I came up with ended up working perfectly! I used some references I found online of the design and made a full sized pattern. Once it was done, I used transfer paper made for fabrics to transfer the design over to the vest. You can see below the design did transfer over, but it was pretty light. It was hard to see, and some places transferred better than others, but it was good enough! In order to make the design, I actually used leather dye! I just took a large liner brush and used it just like a paint or ink. The more layers of dye I used, the darker the design got, so I used that to give the design some dimension. I also used the leather dye to give the edges a darker tone. Once I was done with the leather dye painting, I coated the vest in the same crystal clear gloss enamel from Rustoleum that I used earlier on the necklace and belt to seal it and keep it from smudging. It worked like a charm! And with that the costume was done!